I didn’t wander as much as I wanted to the few days I was at the San Diego Comic-Con. The sheer amount of people threatened to keep me at the Cool Jerk table or, at least, another table of friends. I did manage to deal with the crowds to get some free swag but I found almost nothing to buy for myself. Eric Joyner with the print that stopped me in my tracks. He paints the two things like loves: robots and donuts. 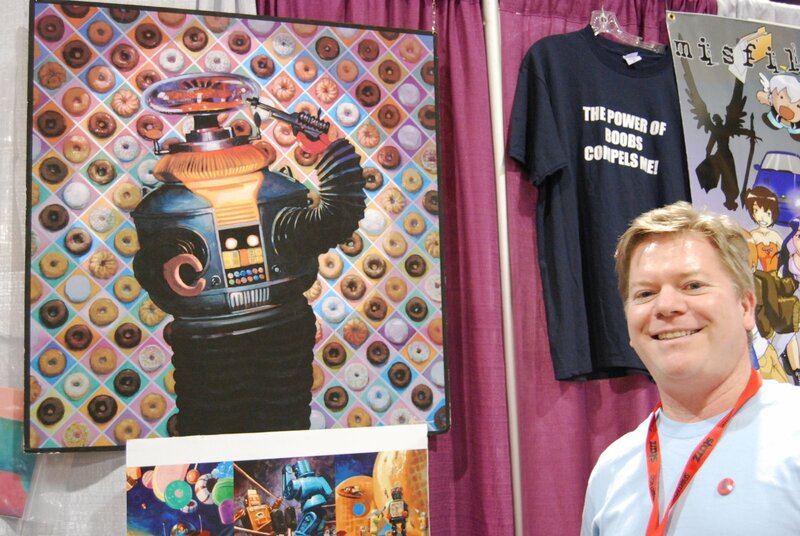 I did discover prints by artist Eric Joyner combining robots and donuts. I stopped in my tracks between wandering aisles to a print of robot holding a gun to his head in front of a selection of donuts. It tickled my sick funny bone when thinking about a robot ending his electrical existence because, according to the artist, he could not make his mind up over which donut to eat. Limited edition prints were available at his booth as well as trade paperback with a selection of his work. They can also be ordered online. Unfortunately I need to order it online since I didn’t have time to revisit his booth and get myself a book. It was too hard to chose just one print and we’re running out of wall space in our condo. I went the the Voo Doo Baby booth intending to get myself a trinket. I had been eyeing two dolls and had never made up my mind of which one I wanted. Instead of walking away with one, I left with both and decided to have someone make the decision for me while they have the the other one. If you haven’t guessed, this my giveaway. 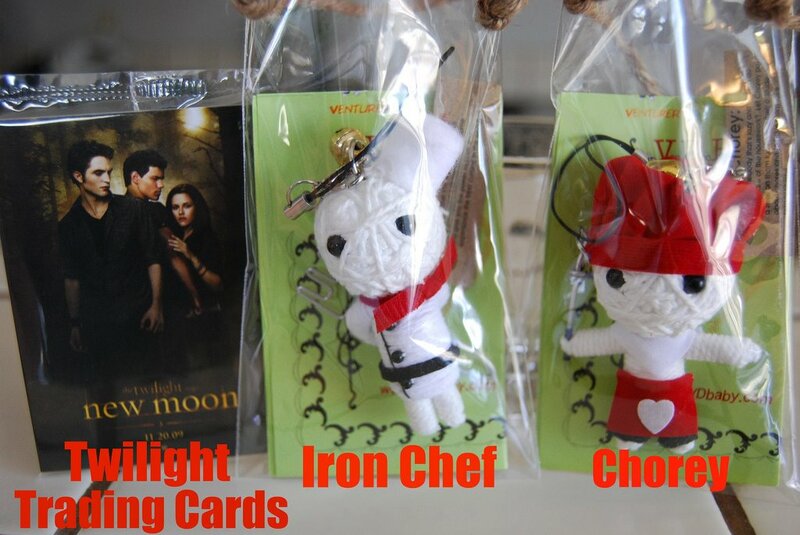 The Voo Doo babies up for grabs are Chorey and Iron Chef. According the the pamphlet, Chorey puts spells on people to do their chores while Iron Chef which gives you the power to cook — hell, everyone needs help in both areas. I certainly do. All you have to do is leave a comment of which one you want and I’ll randomly chose one person to send it off to. I’m also throwing in trading cards for Twilight that somehow made it into my swag bag. Haha…I feel like a TOTAL geek, but I would be happy with just the Twilight cards! I love to cook but sometimes I need an Iron Chef. Well, I already got some of those Twilight cards…best I could do for the niece. No autographs like my Mom requested (and still wants me to get "if I have a chance." Not sure who or what she thinks I am…LOL!)Dude! I totally did not get what I was supposed to from you though! Oh man! I LOVE Joyner! I have his art book and love love love it, I love the donuts! I can't believe I didn't see him, I missed soooo much. It was really sad. If I could do it all over again I would do so much different! I need Iron Chef. 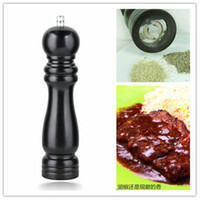 Anything to help my cooking, sometimes the dogs won't even eat it. What. How did you and Jodi get that Twilight crap? I came home and ALL my friends asked me for some and I was like, what? I did all I could to avoid it and apparently I was supposed to pick some up! I love the voodoo babies! I love Iron Chef, how adorable! I need a Chorey in my life! I'd love the Iron Chef. It'll help my already awesome skills better! I would love the Iron Chef! Those Voo Doo babies are freakin' adorable!